As a part of inclusive initiatives for sustainable poverty reduction and beyond-poverty development, PKSF has undertaken the `Cultural and Sports Programme’ for children and young generation. The aim of this Program is to patronize and promote mental & physical development of the young chaps in order to build a talented Nation as a whole. The main objectives of the Program are to create awareness among the young and adolescents generation against all sorts of crimes as: terrorism, sexual harassment, drug abasement, and women-violence or oppression etc. 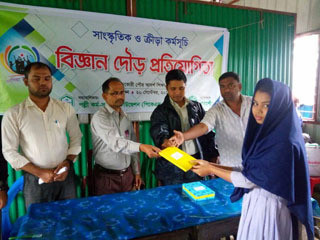 Initially, the Program started in March 2016 with 10 Partner Organizations (POs). Considering the positive impacts of overall poverty reduction and capacity of the organizations the programme has been extended to 60 districts across the country from July 2017. The expenditures of the program are being borne jointly by PKSF and its concerned POs. 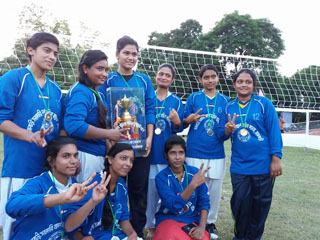 PKSF executes the cost from its Special and Program-Support Fund; while POs bear their part with surplus money from their credit programs..
PKSF usually encourages in arranging the following sports in order to build a healthy nation by the inspiration of ‘Sportsman Spirit’. 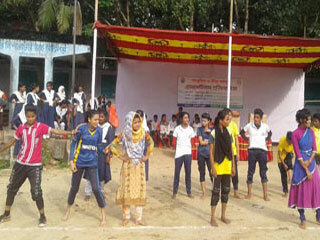 The sports items are: Table Tennis, Football, Cricket, Volleyball, Badminton, Kabadi, Swimming, Mini Marathon and Cycling etc. 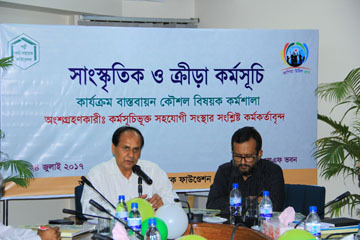 PKSF has undertaken the following cultural activities–The following cultural activities are listed for implementation under the cultural programme: drawing, hand writing, wall magazine, recitation, story-telling, Rabindra and Nazrul songs, folk songs, local songs, acting, and country songs to uphold the traditional and local culture. For the sack of mental and human development through practicing the artistic bent of mind among young generation the following activities has been commenced: competition of book reading, essay writing, story-telling and wall magazine etc. It is good to practice correct and standardized language in all sphere of life. 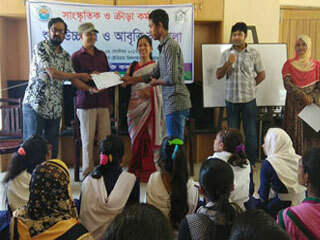 Therefore, PKSF has been organizing the competition of recitation, debate, extempore speech, creative writing along with language workshop in the commanding areas. Bangladesh is one of the most vulnerable countries in terms of climate change and natural calamities. 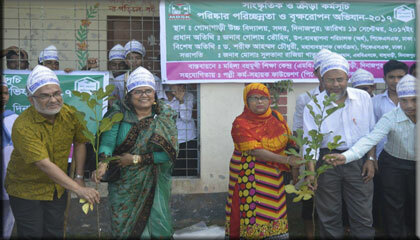 To protect the future generation from the adverse impacts of climate change, PKSF has taken initiatives of planting trees in school yard and encourage students to plant more trees in available lands of their grounds. Besides, cleanliness activities are also undertaken in school and colleges premises under this program. Under this intervention, different awareness campaigns are being carried out to awake the people against anti-social activities like: dishonesty, corruptions, child marriage, drugs addiction, sexual harassment etc. Initially the programme has started in March, 2016 with 10 Partner Organisations (PO). With its positive effects on poverty alleviation, visible benefits and programme progress and in the light of the organisation’s interests and capacities 50 more POs have been included in the programme in July 2017. 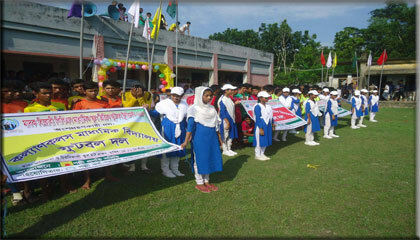 The expenditure of the programme is being borne jointly by PKSF and its POs. PKSF bears 60% of the total cost while POs bear the rest 40 %. PKSF manages proportionate cost from its ‘Special Fund’ and ‘Programmes-Support Fund’ and POs bear its portion from 10% of surplus of the credit programme. The total budget of the programme is BDT 7.05 crore. Each Partner Organisation has been assigned a competent person as a ‘Focal Person’ to carry out the programme. Moreover, most of the organisations have appointed a ‘Field Organiser’ to implement the programme at the field-level. 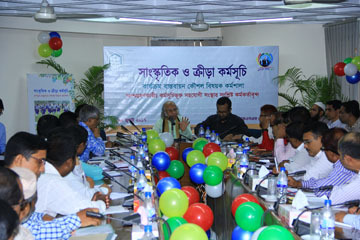 ‘Bangladesh Kishore-Kishori Shommelon 2018’, a national conference of adolescents, was held at Bangabandhu International Conference Center on 21 October 2018. Finance Minister Mr Abul Maal Abdul Muhith, MP, was the Chief Guest at the inaugural session of the conference organised by Palli Karma-Sahayak Foundation (PKSF). Presided over by PKSF Chairman Dr Qazi Kholiquzzaman Ahmad, the inaugural session was graced by Ms Naznin Sultana, a member of the PKSF Governing Body, as the Guest of Honour. 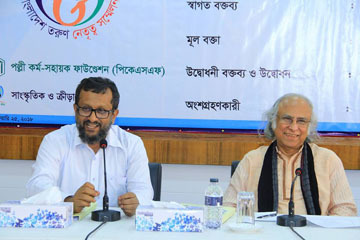 Mr Md Abdul Karim, Managing Director of PKSF gave the vote of thanks while Deputy Managing Director (Program) of PKSF Mr Md Fazlul Kader spoke on the future plan on developing the cultural values of the youths of the country. 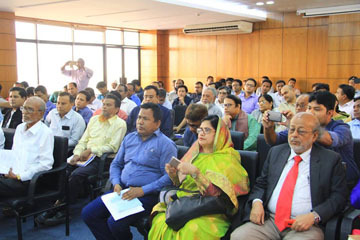 The Finance Minister, in his speech, said though the poverty rate in Bangladesh has decreased significantly, there are still 30 million people in the country living below the poverty line and 10 million of them are ultra-poor. To ensure the development of these people and to bring down the poverty rate below 10 percent, the Government should continue its development process for the next 7 to 10 years, stated Mr Muhith. He also said that the Father of the Nation Bangabandhu Sheikh Mujibur Rahman emphasized on proper utilization of the human resources of the country to rebuild a war-torn country. The adolescents of today will uphold the spirit of Bangabandhu to help Bangladesh continue the development march. And emerge as a developed nation by 2041, the Finance Minister added. Terming inclusiveness as the pre-requisite to sustainable development, PKSF Chairman Dr Qazi Kholiquzzaman Ahmad said PKSF programs and projects are designed and implemented in such a way that no one is left out of the development purview. ‘Dignity for all’ is the overarching purpose of the PKSF interventions. 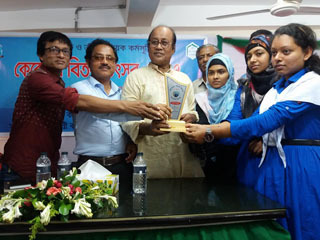 ‘Bangladesh Kishore-Kishori Shommelon 2018’ has been arranged as part of its inclusive development programs, he said, adding that this particular program will help build a nation enriched in its own traditions and cultural values. Mr Md Abdul Karim, Managing Director of PKSF, said that PKSF has taken up various programs to address the life-cycle-based needs of people. 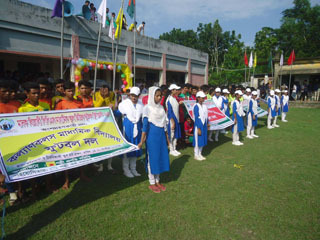 As part of inclusive development program for sustainable poverty alleviation, PKSF is implementing ‘Cultural and Sports Program’, designed in light of the grand initiative of Bangabandhu to build future leadership through formulating Children’s Act. 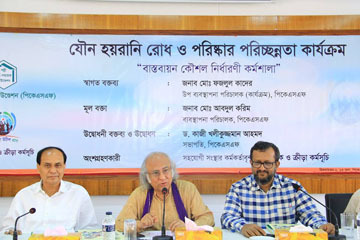 The PKSF Managing Director hoped that today’s adolescents will take forward the unprecedented achievements of Bangladesh in economic, social and human development indices. 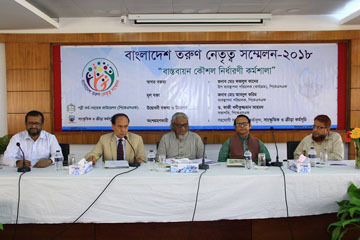 Mr Md Fazlul Kader, Deputy Managing Director (Program) of PKSF said that there is no alternative to developing cultural values for sustainable socio-economic development of the country. He shared the future plans of PKSF’s ‘Cultural and Sports Program’ to equip the adolescents with necessary values to cope with the challenges of the days ahead. 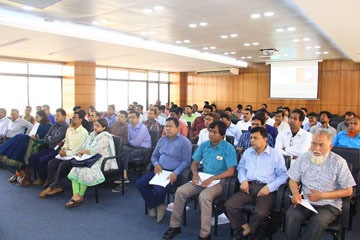 Mr Md Fazlul Kader also highlighted the tremendous responses the program received at the grassroots level within just two years of the launching of the program, and said this program will create a strong foundation to materialize the dream of Bangabandhu’s Sonar Bangla, a prosperous Bangladesh. A total of 710 adolescents — selected from 100,000 participants from 11,000 educational institutions across the country — participated in the conference. They took an oath to work for the welfare of the country as well as for humanity. PKSF Chairman Dr QK Ahmad administered the oath. An adolescent girl, a boy and a teacher also spoke in the program. A workshop on leadership skills and ethics was held in the second session of the daylong conference. Mr Md Ashadul Islam, Secretary, Financial Institutions Division, Ministry of Finance, was present as the Chief Guest at the closing ceremony of the conference while eminent litterateur Selina Hossain was as the Special Guest. The conference ended with a cultural program in the presence of, among others, Hon’ble Cultural Affairs Minister Mr Asaduzzaman Noor. Adolescents from different regions of the country performed in the cultural evening. Under the PKSF’s Cultural and Sports Program, initiatives have been taken to prevent sexual harassment in a specific area. One Para/Mahalla, village, Ward or educational institution in a specific area will be selected for the said activities in each district. The aim of the programme is to create awareness among the general people about the consequences of sexual harassment and make them united to work against any kind of sexual harassment. Initiative has also been taken to conduct cleanliness programme in selected areas. One Para/Mahalla, village, Ward or Union will be selected for the cleanliness programme in each district. An extensive cleanliness activities will be conducted in the area and after one year, the area will be declared as ‘clean area’. In this view, a workshop was held attended by the representatives of 60 POs at PKSF auditorium on February 26, 2018. 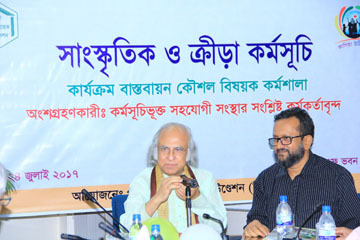 Honorable Chairman of PKSF Kazi Kholiquzzaman Ahmad announced the inauguration of the workshop. Honorable Managing Director of PKSF Mr. Md. Abdul Karim delivered the key speech in the workshop. Mr. Md. Fazlul Kader, Managing Director (Program), presented the perespective of the program. Mr. AHM Abdul Qaiyum, Deputy General Manager (Program) presented the strategic paper on prevention of sexual harassment and cleanliness activities while one representative from Breaking the Silence, an organization which is working on child issues, gave presentation on child abuse. Cultural and Sports Program of PKSF has published a guideline titled’ Implementation Guideline’ for focal person and program organizers in order to run the program’s activities smoothly. The 46-page guideline contains of strategies and detailed instructions for implementing cultural and sports program in the operational field. Besides, a 36-page Photo Album and 21-minutes video documentary titled “Jagiye Uthilo Pran” made on different sports and cultural events have also circulated from the Sports and Culture unit of PKSF. 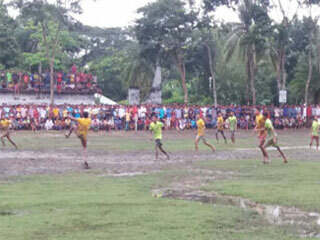 Moreover, this Unit also published a brochure on the activities of cultural and sports Program after all. Palli Karma-Sahayak Foundation (PKSF) organized a national convention on its Cultural and Sports Programme on March 23, 2017 at PKSF auditorium. 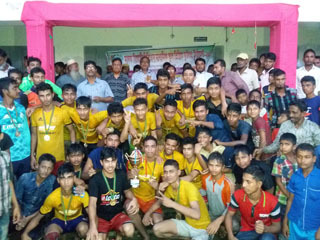 Mr. Asaduzzaman Noor, MP, Hon’ble Minister for Cultural Affairs, graced the program as the chief guest, where Dr. Shree Biren Sikder, MP, Hon’ble State Minister for Youth & Sports, was present as the special guest. The convention was chaired by Dr. Qazi Kholiquzzaman Ahmad, Chairman, PKSF. Many government high-officials alongwith officials of PKSF and its Partner Organisations (POs), officials of development agencies, journalists and other stakeholders attended the convention. Mr. Md. Fazlul Kader, Deputy Managing Director (Program), PKSF gave a presentation on Cultural and ports Programme; which was followed by a documentary film. A workshop on Implementing Strategies of Cultural and Sports Programme in field level was organized on July 24, 2017 at PKSF Bhaban. 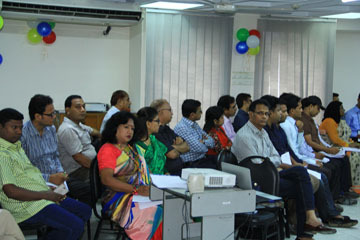 A total of 110 Focal Person and Programme Organizers of 60 Partner Organizations were present in the day-long workshop. 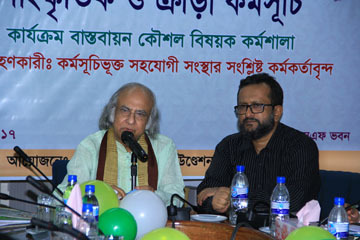 Dr. Qazi Kholiquzzaman Ahmad, Chairman of Palli Karma-Sahayak Foundation, Mr. Md. Abdul Karim, Managing Director of PKSF and Mr. Md. 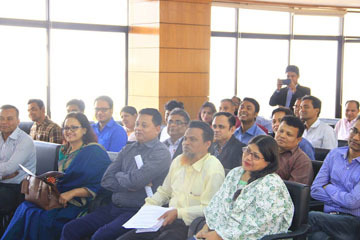 Fazlul Kader, Deputy Managing Director (Programme) were present at the inaugural session of the workshop. Mr. Abul Hasan Md. Abdul Qaiyum, Deputy General Manager (Program), PKSF gave a elaborate presentation on strategies for Cultural and Sports Programme at the field level. Dr. Qazi Kholiquzzaman Ahmad, Chairman, PKSF, inaugurated the official Face-book page of Cultural and Sports Programme on October 12, 2017. He pushed like button of the page and watched the contents & comments made by different organizations as a whole .